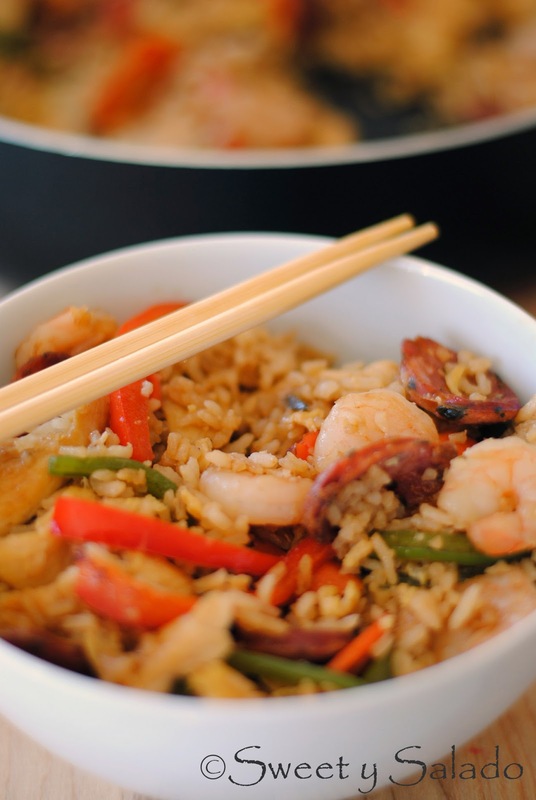 I know that you may be confused by the name of this recipe but fried rice, or “Chinese rice” as many people call it, is one of the most popular recipes in Colombia. I don’t know exactly why they love it so much, it could be because it is made with rice which is an essential ingredient in Colombian cuisine (remember the Colombian arroz con pollo recipe? ), it could be because it’s so easy to make and yet it still has that “fancy” look when you serve it, it could be the saltiness from the dish since many Colombians really like their food to be well seasoned, or it could it all of the above. Chinese restaurants are very popular in Colombia and this dish became a house favorite when I was kid. Everyone had to order it, except for my dad because he had to be different and would always order some pineapple soup followed by some weird beef dish, and the reason I say it was weird is because I was a kid and it looked too “grown up” for me. 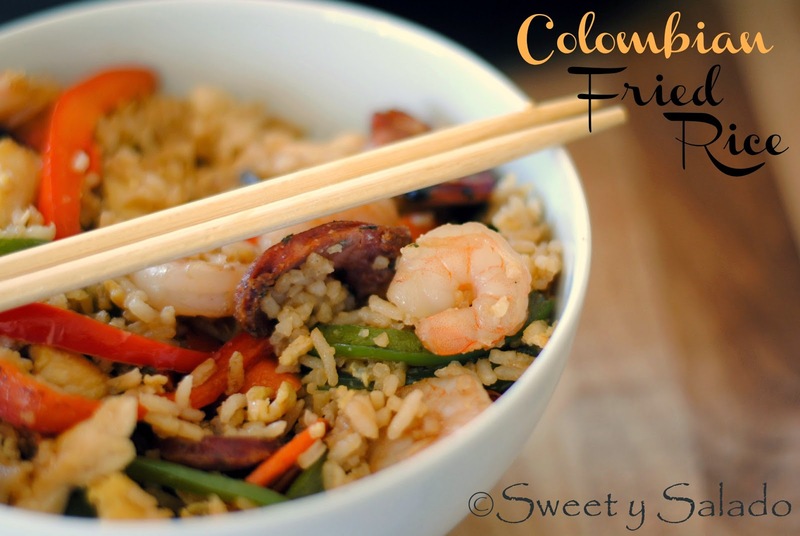 Colombians then decided to make fried rice at home and began adding their favorite ingredients which can include, bean sprouts, peppers, cilantro, Colombian chorizo and some times hot dogs. I know it sounds weird but they really love to cook with hot dogs. But like I’ve said in previous posts, feel free to add whatever meat or vegetables you want in your fried rice. This is one dish that it’s impossible to mess up. 1. Heat 1 tbsp of oil in a large pan or wok on medium high heat. Add the chorizo and cook for about 2 minutes or until it’s cooked and browned on both sides. Remove from the pan and set aside. 2. Add the shrimp to the same pan and cook it in the chorizo drippings for about 2-3 minutes or until it’s no longer opaque. Remove from the pan and set aside. 3. Add another tbsp of oil to the pan and then add the carrot, red pepper and green pepper. Season with salt to taste and cook until they are tender, approx. 2-3 minutes. Remove from the pan and set aside. 4. Add the last tbsp of oil to the pan and then add the chicken. Season with salt to taste and add the sesame oil. Cook for about 2-3 minutes or until no longer pink. 5. Add the rice to the chicken and stir fry for about 1 minute to re-heat it. 6. Push the rice and chicken to one side of the pan and then add the beaten eggs. Scramble until they’re almost done and then mix them with the rice and chicken. 7. Now, add the chorizo, shrimp and vegetables to the pan and stir. 8. Add the soy sauce and oyster sauce and mix thoroughly. Thanks for sharing yet another great recipe! In our house, you are the best, delivering one great recipe after another.